People nowadays are in a rush to stay fit and get healthy. In our quest for the ultimate health foods we often disregard precious spoils of nature such as the plain, but nutritious sunflower seeds. It may come as a surprise, but sunflower seeds are incredibly healthy and full of essential nutrients. A little over 100 g of sunflower seeds, will have undoubtedly met your daily allowance for all the important minerals and even surpass it for some vitamins. Imagine eating a handful of sunflower seeds and getting all the magnesium your muscles and bones need, a full dose of manganese, all the B-group vitamins your body requires and a triple dose of vitamin E. How incredible is this? Sunflower seeds are truly the ultimate health food. Sunflowers are cultivated in order to meet the demands for cooking oil where healthier options (such as olive oil) are not available, mostly due to climate specificity. In some Central and Eastern European countries, the US, Morocco, and China, sunflowers are also appreciated for their unique taste and are a preferred snack. But how many people who eat them actually know how amazingly healthy they are? Sunflowers are an incredibly rich source of vitamins and minerals. Approximately 100 g of seeds are enough to supply our body with all the thiamine and vitamin B6 we need. Vitamin B1 is essential for a healthy nervous and cardiovascular system; in addition to sustaining heart and nerve activity, it is indirectly responsible for supplying our body with energy by ensuring its proper distribution. Vitamin B6 prevents heart disease, helps maintain a healthy nervous system and helps break down proteins. 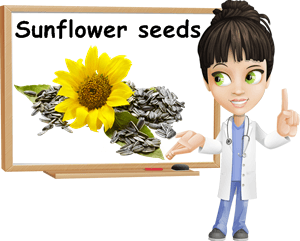 Moreover, sunflower seeds have a high content of other B-group vitamins such as: niacin, pantothenic acid and folate. Niacin, or vitamin B3 boosts HDL cholesterol levels (HDL is the good cholesterol) while lowering tryglicerides and is a good ally of the heart. Severe niacin deficiency may lead to serious medical conditions such as pellagra. Follate prevents neural tube defects of the fetus and is highly recommended before and during pregnancy. In addition to this, studies show it offers protection against colon, stomach and pancreatic cancers. Although there is little to no vitamin C in sunflower seeds, they have a staggering high content of vitamin E, more than double the recommended daily intake. Vitamin E is essential for skin beauty and with such high doses of it, imagine how smooth and beautiful your complexion will be, provided you eat sunflower seeds on a regular basis. You might as well say that sunflower seeds are the key to a beautiful, radiant skin. Last but not least, sunflower seeds have choline (a sort of new B-group vitamin), the same found in human milk. Choline is essential for proper brain development in infants and there are studies that suggest it may prove to be an efficient anticancer nutrient. Still not amazed? You will be when you hear that sunflower seeds provide you with all the important minerals. For instance, they are extremely rich in magnesium. As you may already know, magnesium sustains muscle activity (the heart being the biggest muscle of all). What you might not know is that is plays a crucial role in preventing osteoporosis and arthritis by ensuring the proper distribution of calcium in bones and maximizing its absorption. Manganese and phosphorus are also found in more than generous amounts in sunflower seeds kernels. While manganese has potent antioxidant effects, phosphorus is pivotal for teeth and bone formation (by sustaining the bone-strengthening function of calcium) and proper digestion. Potassium regulates body fluids, heart rate and lowers high blood pressure, while zinc boosts the immune system. Aside from vitamins and minerals, sunflower seeds contain linoleic acid, a precious Omega-6 essential fatty acid that our body cannot produce by itself but requires in order to function properly. Linoleic acid is believed to be highly efficient against a number of serious medical condtions such as cardiovascular disease caused by high cholesterol and high blood pressure, reduce the risk of cancer and strengthen immunity. Even more amazing, sunflower seeds are rich in dietary fiber: approximately 8 g of fiber per 100 g of seeds, making them and excellent remedy against constipation and a fierce ally for anyone looking to lose weight. In addition to this, sunflower seeds have a low-glycemic index. Foods with a low-glycemic index are believed to reduce the risk of heart disease and type 2 diabetes. Sunflower seeds are also highly appreciated in traditional medicine. For example, both sunflower seeds powder and a decoction made from crushed seeds are used as an effective treatment for bronchitis, laryngitis and tonsillitis. Additionally, they are said to be extremely efficient cold and flu remedies. However, such claims do not enjoy scientific support. All in all, sunflower seeds are an incredibly healthy option for a good diet. So why spend tons of money on vitamin supplements when you can get your daily allowances of vitamins and minerals from only 100 g of raw sunflower seeds? The truth is you don’t need a strange, exotic root to cure you. You can build up your health with incredibly nutritious sunflower seeds you can grow in your own garden.